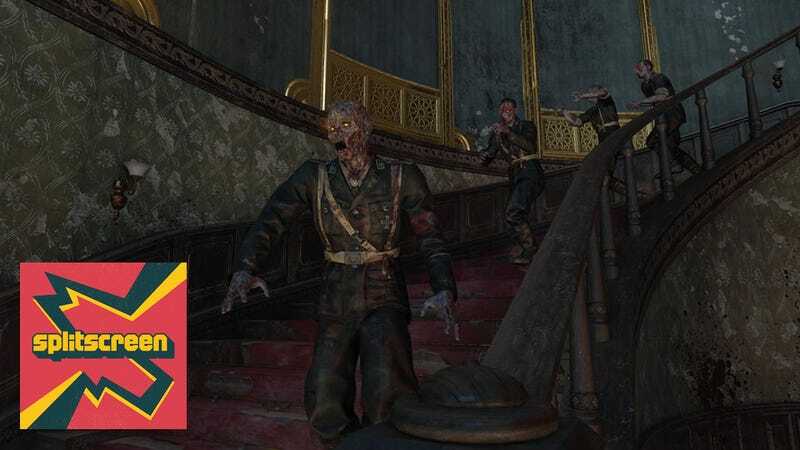 Jesse Snyder, the creator of Call of Duty’s Zombies mode, sacrificed sleep and faced internal pushback when making the now-iconic undead mode for the game. In the process, he also realized he’d rather make less realistic games, not the gritty simulation fare of Call of Duty. Now, he’s the creative director at NantG, and this week at GDC, Jason and I interviewed him about his past and future on Kotaku Splitscreen. In the second half of the episode (34:45), we talked to Andrew Maximov, the CEO and founder of Promethean AI, which is a software tool aimed at making video game artists’ lives easier. Maximov describes this tool as a (robot) junior artist who helps with the grunt work, allowing the human artists to focus on the grander creative details. Jason: So you left Treyarch right after that? Right after the game shipped? Jesse Snyder: Yeah, pretty much. I started on Black Ops 1, and the final catalyst was my wife’s mother’s fiancé had died in Vietnam. And so now here I am working on-they were saying it was going to be this Vietnam game, and I was really uncomfortable with that. And I’d even had some uncomfortable conversations even working on World War II games, where my wife’s grandfather fought in Bastogne, and I’d worked on a Bastogne level, and so he’s asking me about it. And I didn’t know it, right? And then I felt like I was walking into this trap, and I felt really embarrassed and bad. It’s like, I’m making money for companies off of things that these people did. Jason: That’s a weird thing to grapple with. I was in the office the other day and Stephen Totilo my boss, who sits across from me, was watching some trailer of some military shooter, and even just hearing the sounds kind of creeps me out. The weird glorification of military shooters has never quite sat right with me. What was that like to grapple with? Jesse: For me, it wasn’t so bad. It was just one more thing. Like, okay, I want to go be doing something else. And that’s really why I wanted to go. Part of it was Zombies, doing crazier stuff like that. I’ve always been into games that are just more interesting, rather than trying to be sim type stuff. Although, that being said, one of my favorite games is Kerbal Space Program. Maddy: Which is exactly like reality. As we all know. Jesse: [laughs] Yeah. “Hey, I have an idea for a mode. Take the Flood...” We were joking about that a lot. Maddy: This idea just followed you at every job you ever had after that? It’s the zombie guy!